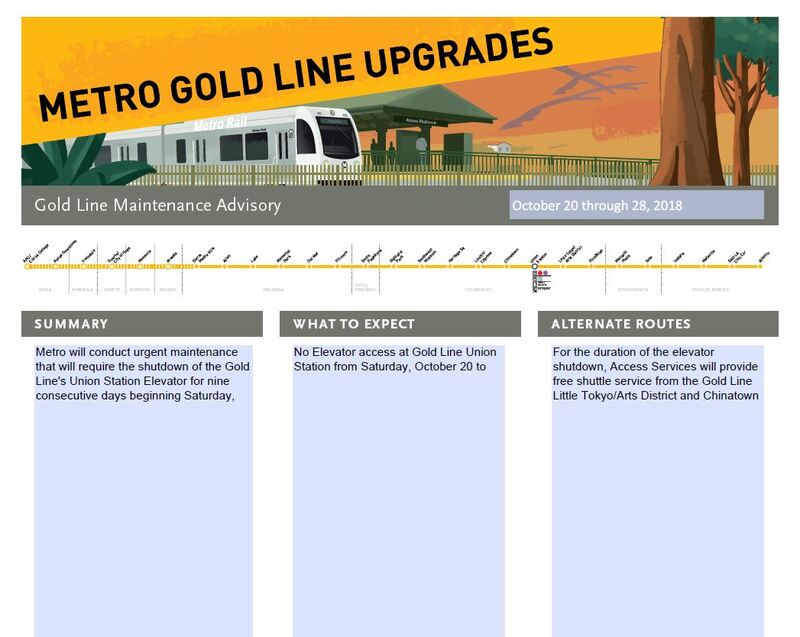 The Union Station Gold Line elevator will close beginning Saturday, October 20 to undergo necessary maintenance work. While the closure is in effect, Access Services Shuttles will be provided at Little Tokyo/Arts District, at Chinatown Station on Alameda and College and Patsaouras Plaza Bus Bay 4 at Union Station. Regular elevator service will resume Sunday, October 28. For more service details, call 323.GO.METRO. This is why ALL stations need TWO elevators. This happens more often than you think…so sick of hauling luggage down/up 5 flights of stairs!